Are you looking for a healthy, vegan, yet super delicious cake? Well I then have the perfect recipe for you! 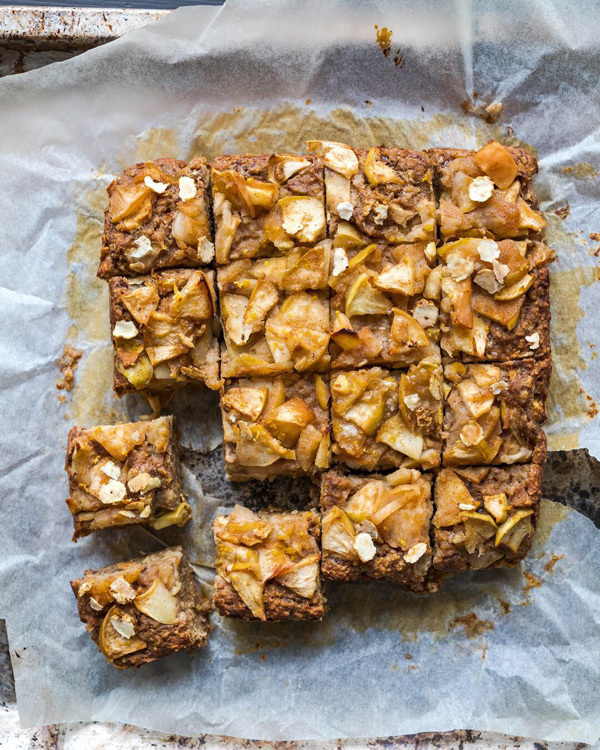 This moist apple c ake will blow your mind! I made this recipe out of scratch with a friend a few weeks ago, only measured a couple of ingredients and then it turned out so good! My followers on my Instagram were going crazy and wanted to have the recipe immediately..but I didn´t note the exact ingredients.. so I made it again a few days later and now here is the final recipe! I am in love! So so moist and super clean recipe! 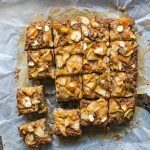 If you have been reading my recipes on this blog you might have already realised that I try to avoid oil and refined sugar and for fun I also sometimes bake gluten-free cakes. So this recipe can be also made gluten-free! Check out my gluten-free sweet potato chocolate cake recipe as well! 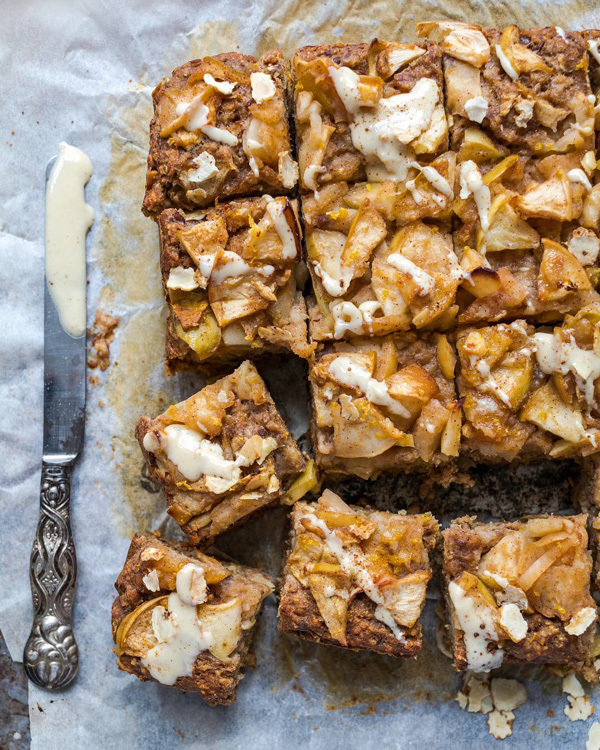 Now before stealing your time any longer, let me present my new favourite apple cake recipe! Make sure to use sour apples if possible! Mine were from a garden, totally organic! Do you also prefer moist cakes? Preheat your oven to 180-200°C. Line your baking try (20x20cm) with some baking paper. Soak your ground flaxseeds in a small bowl with the water. Let it sit. Blend your oats in a blender or food processor. This way you will get oat flour. Mix your oat flour, spelt flour, cinnamon, baking powder and baking soda in a bigger bowl. In the meantime chop your apples into pieces (they don’t have to be that small) and add them in a medium sized pot. Add the cinnamon, nutmeg, apple sauce and water. Mix and let it simmer for about 15 minutes. But there is no rule here. You can also cook the apples very soft, as you prefer. Add your dates to a food processor and add the water, vanilla and almond butter to it. Mix it. Add some of the milk to it as well. You can add the zest of your lemon now as well. Mix again. Mix your date-water mixture to your dry ingredients, scrape out your food processor with a spatula. Add the rest of the milk and your soaked flaxseeds. Add half of the cooked apples. Mix with a spoon but don´t overmix it. Pour your batter into your baking tin and add the rest of your cooked apples on top. Sprinkle some slivered almonds on top if you like and bake your cake for about 45-50 minutes. I prefer my cakes nice and moist. Check your cake after 40 minutes with a toothpick if it is done. Every oven is different so make sure to check your cake after 40 minutes and decide for yourself whether it´s ready or not! If you liked this recipe and made it yourself, please leave a comment and if you share it on Instagram, tag me at @yolcsita_eats and use my hashtag #eatlikeyoli! I will share all of them in my stories! This recipe was my inspiration.